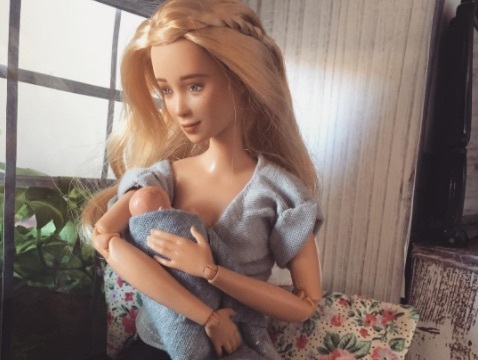 Barbie can be a coder or an architect, and thanks to one mom's artistry, Barbie is also now a breastfeeding mama! Australian mother of two boys and dollmaker Betty Strachan reimagined the iconic doll in a much more relatable fashion. She takes Barbies, strips them of their showgirl-like makeup and repaints their faces to reflect a doll who looks more like the new moms we are and see around us -- their faces light or absent of makeup, with a happy yet exhausted glow. Then she adds the necessary accessory: a tiny doll baby. Strachan, who has been repainting dolls for the past four years, recently came up with her "Mamas Worldwide Barbie," and the down to earth dolls have become an internet sensation. The idea for the breastfeeding Barbie was born as a result of Strachan’s involvement with a mother’s group. Inspired to recreate and reflect the reality of breastfeeding and to educate children on breastfeeding, she positioned one of her dolls to include a baby nursing. On her Instagram site, she photographed the serene-looking Barbie with her baby in several breastfeeding poses as well as some accurate “messy hair don’t care” dos since, as we all know, our personal appearance isn’t typically high on the priority list when juggling life with a newborn. How awesome is it that instead of a bright-eyed Barbie, Strachan created one that even appears to have bags under her eyes? We’d love to see if those bags disappear and are replaced with laugh lines as the dolls and their children “age” under Strachan’s observant and reflective artistry. As a result of the internet’s interest, Strachan is currently a bit back-logged on doll requests. In the meantime, you can peruse Strachan’s dolls on Instagram and Facebook. She also previously created several pregnant Barbies and reimagined dolls of children as well. Check out her before and after shots from this doll to get an idea of how ridiculously overdone some kid dolls are. The idea for the breastfeeding Barbie was born as a result of Strachan's involvement with a mother's group. 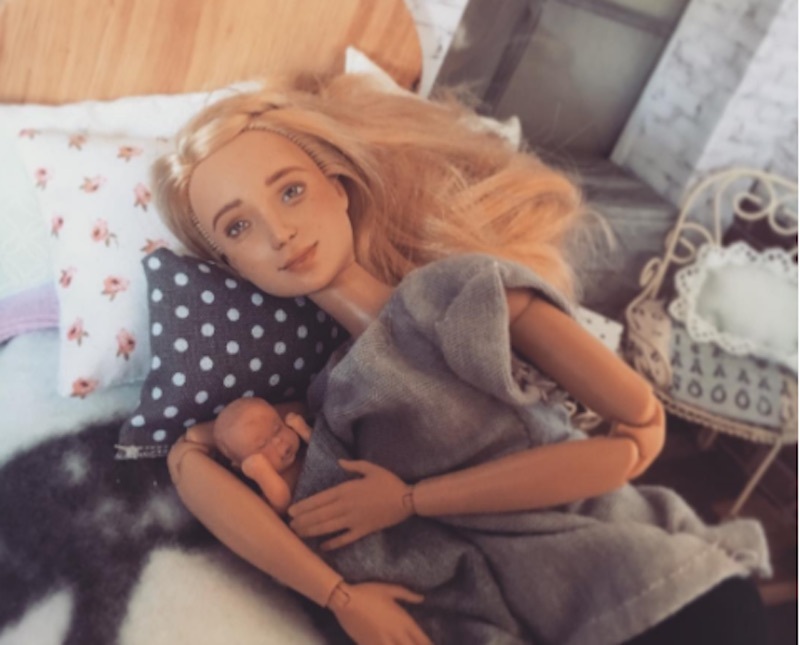 Inspired to recreate and reflect the reality of breastfeeding and to educate children on breastfeeding, she positioned one of her dolls to include a baby nursing. 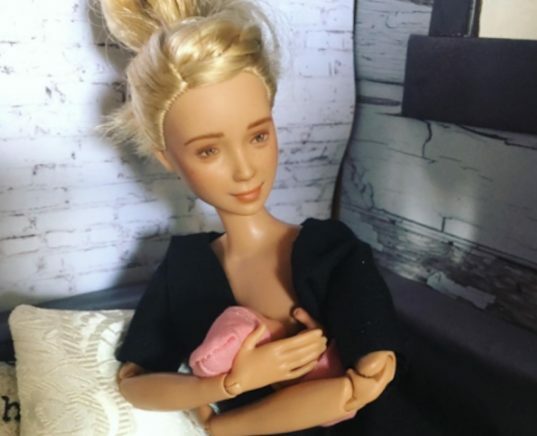 On her Instagram site, she photographed the serene-looking Barbie with her baby in several breastfeeding poses as well as some accurate "messy hair don't care" dos since, as we all know, our personal appearance isn't typically high on the priority list when juggling life with a newborn. How awesome is it that instead of a bright-eyed Barbie, Strachan created one that even appears to have bags under her eyes? We'd love to see if those bags disappear and are replaced with laugh lines as the dolls and their children "age" under Strachan's observant and reflective artistry. As a result of the internet's interest, Strachan is currently a bit back-logged on doll requests. In the meantime, you can peruse Strachan's dolls on Instagram and Facebook. She also previously created several pregnant Barbies and reimagined dolls of children as well. Check out her before and after shots from this doll to get an idea of how ridiculously overdone some kid dolls are.